How Does Deforestation Affect the Landscape? 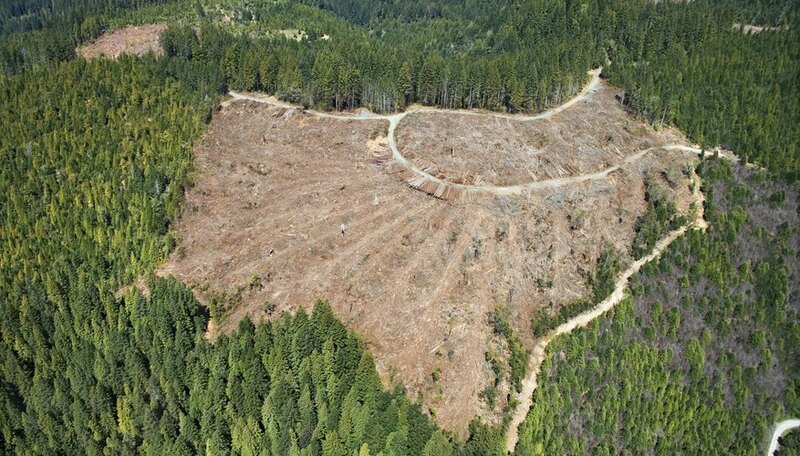 Deforestation is typically a side effect of human activities such as logging, agriculture or land development. It can have a significant effect on the local ecosystem, from further stressing an already threatened species to upsetting the soil where trees once stood. Because trees support the lives of countless organisms and play a major role in maintaining the stability of a region, their removal has a wide range of effects. Deforestation and the human activity that accompanies it can have the biggest impact on a region's most vulnerable species. For example, a 2013 study found the the tiger population in a section of the Indonesian island of Sumatra has been severely impacted by the heavy local deforestation that has occurred there. The study focused on the Sumatran province of Riau, which has "one of the highest global rates of deforestation," the authors said in their report. Using camera traps and widely-accepted spatial estimation methods, the team of American and Indonesian scientists found that the population densities of tigers in various sections of the province were much "lower than most previous estimates in other parts of Sumatra." They added that the tiger population in the nearby Tesso Nilo Park, where human activities have been reduced by legal measures, is much denser and more stable. The soil of a landscape is also severely affected by the large-scale removal of trees. A lack of trees robs the soil of decaying organic material that eventually decomposes into new dirt. A 1994 study from Iranian researchers that evaluated the effects of deforestation on physical and chemical properties of soils in the Lordegan region of Iran found a 50 percent decrease in organic matter and total nitrogen for soil from a deforested area compared to undisturbed forest soil. They also found soils from deforested areas to have a lower tilth index coefficient, meaning it is now less suitable for planting crops. The Iranian research team from the Isfahan University of Technology concluded that deforestation "resulted in a lower soil quality, thus decreasing the productivity of the natural soil." 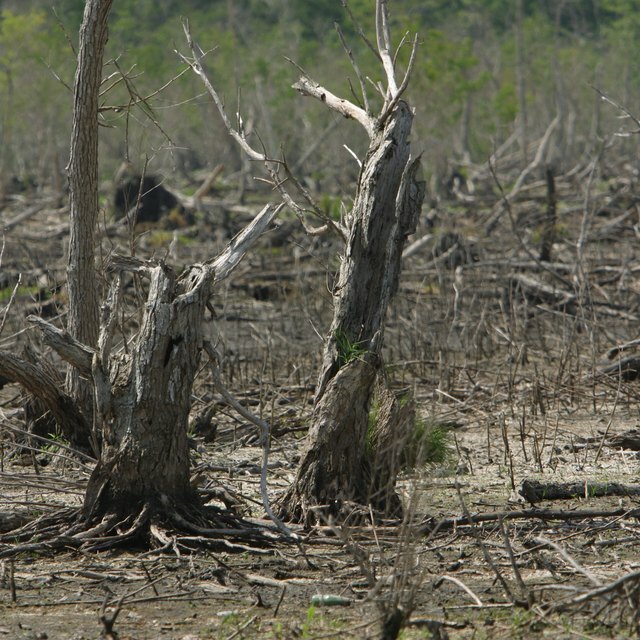 While most climate models are based on the assumption of a uniform and self-sustaining landscape, deforestation often occurs as a patchwork, with some sections or forest falling as others remain. According to NASA observations, sections of deforested area can become “heat islands” that increase the convection of air that leads to cloud formation and rainfall. These tend to concentrate over clearings. While it is currently unknown if the localized increase of rainfall continues as deforestation in a region progresses, NASA has speculated that more sophisticated climate models could be developed to determine the local climate effects of partially deforested landscapes. Carbon sequestration is an important part of the carbon cycle, in which trees and other plants take in carbon dioxide for their metabolic processes, so trees help regulate the amount of carbon dioxide in the Earth's atmosphere. When trees are cleared with fire, not only is a forest's capacity to absorb carbon from the atmosphere reduced -- it also sends carbon from the trees being burned back into the atmosphere. According to a 2013 study from a team of American scientists, reforestation actually boosts the amount of carbon being sequestered in the soil beneath trees -- suggesting that deforestation lowers the amount of carbon being sequestered in the soil. In one reforested landscape that had been cleared for mining, the study team found that the amount of soil carbon nearly doubled within two decades of the activity being halted -- and continued to double about every decade from then on. How Does Deforestation Affect the Air? Smith, Brett. "How Does Deforestation Affect the Landscape?" Sciencing, https://sciencing.com/deforestation-affect-landscape-12324035.html. 25 April 2017.